"A Ghost Story" by Mark Twain (the pen name of Samuel Clemens) appears in his 1875 Sketches New and Old. The story is based on the infamous 19th-century hoax of the Cardiff Giant, in which a "petrified giant" was carved out of stone and buried in the ground for others to "discover." People came in droves to pay money to see the giant. After a failed bid to buy the statue, the legendary promoter P.T. Barnum made a replica of it and claimed it was the original. Plot of "A Ghost Story"
The narrator rents a room in New York City, in "a huge old building whose upper stories had been wholly unoccupied for years." He sits by the fire awhile and then goes to bed. He wakes in terror to discover that the bed covers are being slowly pulled toward his feet. After an unnerving tug-of-war with the sheets, he finally hears footsteps retreat. He convinces himself the experience was nothing more than a dream, but when he gets up and lights a lamp, he sees a giant footprint in the ashes near the hearth. He goes back to bed, terrified, and the haunting continues throughout the night with voices, footsteps, rattling chains, and other ghostly demonstrations. Eventually, he sees that he is being haunted by the Cardiff Giant, whom he considers harmless, and all his fear dissipates. The giant proves himself to be clumsy, breaking furniture every time he sits down, and the narrator chastises him for it. The giant explains that he has been haunting the building, hoping to convince someone to bury his body—currently in the museum across the street—so he can get some rest. But the ghost has been duped into haunting the wrong body. The body across the street is Barnum's fake, and the ghost leaves, deeply embarrassed. Usually, Mark Twain stories are very funny. But much of Twain's Cardiff Giant piece reads as a straight ghost story. The humor doesn't enter until more than halfway through. The story, then, showcases the range of Twain's talent. His deft descriptions create a sense of terror without the breathless nervousness you'd find in a story by Edgar Allan Poe. "The place had long been given up to dust and cobwebs, to solitude and silence. I seemed groping among the tombs and invading the privacy of the dead, that first night I climbed up to my quarters. For the first time in my life a superstitious dread came over me; and as I turned a dark angle of the stairway and an invisible cobweb swung its sleazy woof in my face and clung there, I shuddered as one who had encountered a phantom." Note the juxtaposition of "dust and cobwebs" (concrete nouns) with "solitude and silence" (alliterative, abstract nouns). Words like "tombs," "dead," "superstitious dread," and "phantom," surely bode a haunting, but the narrator's calm tone keeps readers walking right up the stairs with him. He is, after all, a skeptic. He doesn't try to convince us that the cobweb was anything but a cobweb. And in spite of his fear, he tells himself that the initial haunting was "simply a hideous dream." Only when he sees hard evidence—the large footprint in the ashes—does he accept that someone has been in the room. "All my misery vanished—for a child might know that no harm could come with that benignant countenance." "You have broken off the end of your spinal column, and littered up the floor with chips off your hams till the place looks like a marble yard." Until this point, readers might have thought that any ghost was an unwelcome ghost. So it's amusing and surprising to find that the narrator's fear depends on who the ghost is. 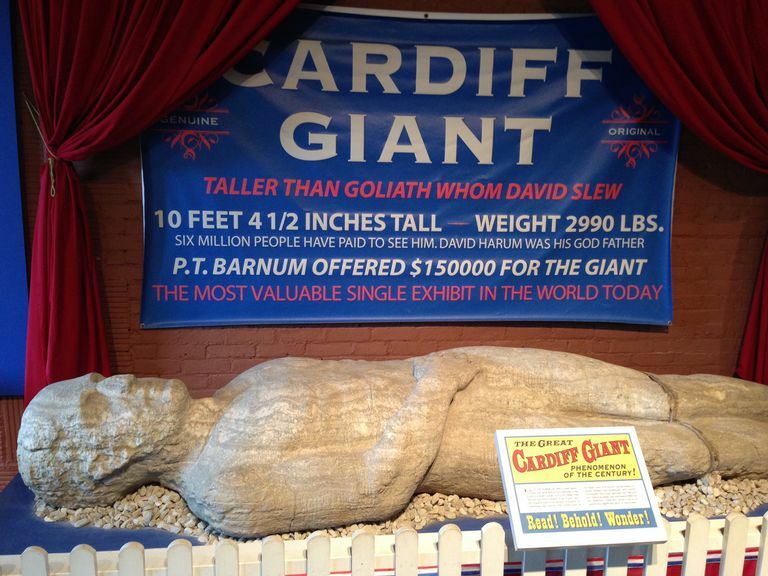 Twain took great delight in tall tales, pranks, and human gullibility, so one can only imagine how he enjoyed both the Cardiff Giant and Barnum's replica. But in "A Ghost Story," he trumps them both by conjuring up a real ghost from a fake corpse.